I was on my way to work and got rear-ended on an off-ramp (thankfully, I was not injured at all nor was anyone else). The impact was enough to pretty much destroy the van's rear hatch, and it also shoved me into a pickup truck in front. Said truck, a mid-80's Ford F250 with bumpers which wouldn't have looked out of place on a Sherman Tank, was barely scratched. Unfortunately, the damage to my rear end was, given the original TechMobile's age (17 years, of which we got 14) and high mileage (294K), considered to be a 'Total' by my insurance carrier. Thankfully, I had the footage from my dash-cam to prove, conclusively, I was not at fault. My insurance company even refunded my deductible because of this. It's interesting to note the van was still driveable after the incident, but the radiator failed a couple of days later. Thus began the (somewhat frantic, admittedly) search for a new set of wheels. My lady and I wanted to stick with a minivan, but neither one of us were terribly thrilled about the current offerings from Chrysler/Dodge (way too much highly-reflective chrome trim in the passenger compartment, well within range of the driver's line of vision). Based on some serious homework, and advice from my regular mechanic, here's what we settled on. You're looking at a 2017 Toyota Sienna SE. This was taken after I finished refitting it with the requisite radios and supplemental safety gear. The light bar was salvaged from the original van, and has long since been converted to use all-LED light heads. No more power-hungry/RF-noisy Xenon strobes or incandescents in this bar! The antenna arrangement has changed completely. Where the original van had six mounts plus GPS, this one only needed two NMO mounts and an extra 'sharkfin' combo antenna (behind the light bar, not visible in this photo). One of the two NMO's is supporting the Larsen dual-band whip visible in the photo. The second is reserved for future use and is currently rain-capped. The mounts, and the sharkfin, are all aligned on the vehicle's center to provide optimal ground plane effect. One thing I want to mention early on: In order to do a proper antenna installation with the Sienna vans, you HAVE to drop the headliner. There's just no easy way to do it without risking serious damage to the van's interior components, or falling back to poor-performing thru-glass antennas. I learned the hard way that dropping said headliner, even with a full set of instructions obtained from Toyota TIS, is neither simple nor quick. I would strongly recommend you reserve a full day for the job, have a friend along to help, and have a LARGE working space available to stack all the interior trim which gets pulled out until it's time to reinstall it. You also need the proper tools. Get yourself a good automotive trim-removal kit, and have a handful of spare clips and fasteners used to hold the interior trim in place. No matter how careful you are, you're going to break at least the 'Christmas Tree' style fasteners which hold the headliner up. It's as inevitable as breathing! 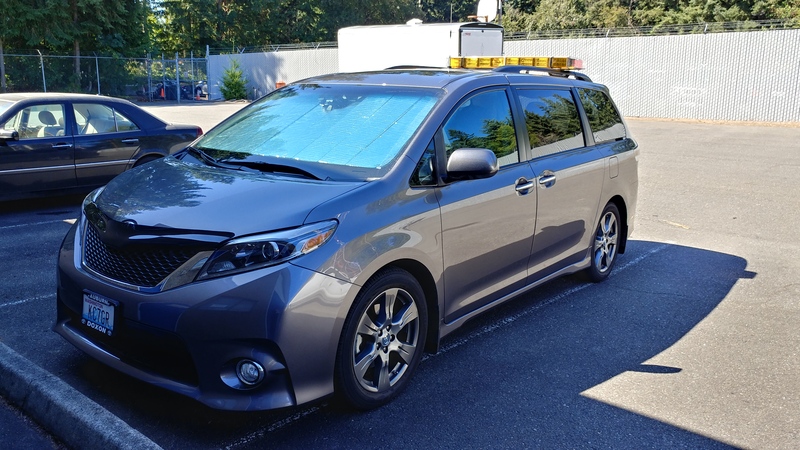 A big reason for the reduced antenna count: The Sienna has most of the 'infotainment' electronics I would want in a vehicle already built in: GPS Navigation system, XM Satellite and HD radio tuners, along with stock AM/FM, CD and USB capability. It also provides Bluetooth integration with my phone. The original Dodge van was much too early a model year (2000) to have any of this as standard equipment, which was why it had so many antenna mounts and so much extra gear. As for the sharkfin: It's dedicated to doing GPS and 3G/4G cellular for the Enfora GPS tracking beacon I installed. Rather than trusting some outside company with data as potentially sensitive as my real-time location, I set up my own GPSGate server on our private home network. The tracker's data goes straight to it, which helps my wife see where I am if I happen to be on a road trip without her along. Moving along to the interior: Here's a photo of the rebuilt console, a Havis C-3010, the shell of which was salvaged from the original TechMobile. Cupholders (of course!) and widget-tray. Modified Bendix/King KMA-24 series aircraft audio control panel. The mods consist of, among other things, disabling the unnecessary marker beacon receiver (to reduce current draw and interference risks); Externalizing the volume controls for both headset and speaker amps; And replacing the incandescent bulbs (panel backlights) with LEDs. I found it helpful, for that particular tweak, to use LEDs with built-in resistors (specifically, VCC Electronics part #LTH3MM12VFR4500). No power conversion or modification was necessary because this particular panel is designed to run on either 12V or 24V systems by default. The microphone shown is dedicated to the PA function described below. The mounting bracket for the panel had to be a custom design/cutout, since this is not an accessory which Havis would normally build a bracket for. Twin Motorola XPR5550 DMR radios, one for VHF (2 meters) and one for UHF (440 band). Both can do analog channels as well as digital, so I don't lose any coverage on that side. The mounting brackets are Havis part number C-EB25-MXP-1P. Control head for the Whelen 'Smart Arrow Messenger' on the back-side of my light bar. This is an alphanumeric sign board which Whelen produced for the early 'Edge 9000' series bars. They've long since stopped making them, so there was no later model made to fit the newer 'skinny' light bars (unfortunately). It can display any one of a library of pre-set messages, selected by number or the up/down arrow buttons. And, by grounding a single input wire on the control head, it can display an additional message dedicated to that input alone. The mounting bracket is Havis P/N C-EB30-MGC-1P. Control head for the Whelen 'CanTrol WC' system. This is what handles all functionality for my PA, light bar, and power switching for various accessories. Although it has full siren capabilities, I don't have them enabled (I'm a volunteer first-responder, not a cop-car). The PA speaker is mounted behind the front grille on the driver's side (again, not visible in the photo), using a pair of custom bracket pieces I fabricated from aluminum bar stock. As for the head, it uses a standard Havis P/N C-EB40-CCS-1P. Power switches and 12V outlets. The switches are standard Carling Technologies Contura V-Series, Contura-IV to be exact. They've been equipped with custom laser-etched rockers from Rocker Switch Pros. The panel itself is a standard Havis part number C-LP2-PS2. Blank 3-inch filler panel, Havis P/N C-FP-3. 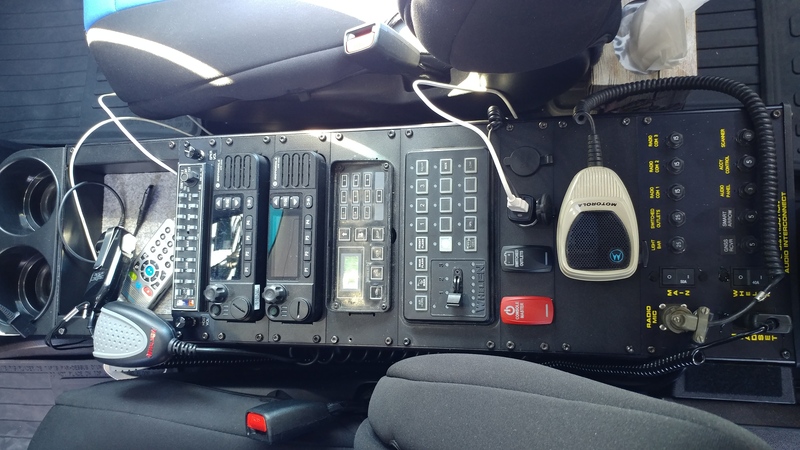 This space is reserved for later use (most likely a trunk-tracking scanner, when I get around to putting one in), and currently sports a spare microphone clip to safely stash the radio system's hand mic. Last, but certainly not least: A custom-designed DC distribution (via aircraft-type circuit breakers) and audio interconnect panel. I did the design for this one myself, using the free software from Front Panel Express. You can design just about any kind of panel you might need, and they'll machine it for you with any combination of colors, infill engraved lettering (which I used here) or other graphics. They can use material you supply, or you can have them supply it. That's it for now. Please feel free to drop me a note if you'd like more details about some aspect of the installation. 73, de KC7GR!